Which Space Mission Was Guided Home Safely With A Wristwatch And Grease Pencil? What Late 1990s Alternate Time Keeping Method Failed To Catch On? 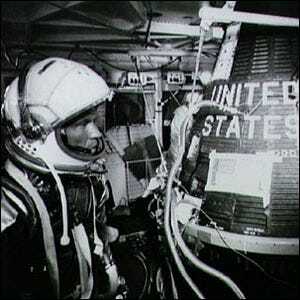 On May 16, 1963, NASA astronaut L. Gordon Cooper, Jr. found himself in a rather tight spot. Cooper was the sole crew member aboard Faith 7, an orbital spacecraft ferried aloft as part of the Mercury-Atlas 9 space mission by an Atlas LV-3B rocket—the first, and only, day-long mission in the Mercury program. For the majority of Cooper’s time in space, orbiting the Earth almost two dozen times over the course of a day and a half, the mission was problem free. As the time for re-entry drew near, however, problems began cropping up. On the 20th orbit, Cooper lost altitude readings and on the 21st orbit, a short-circuit left the automatic stabilization and control systems without power. In addition to the electro-mechanical failures, the level of carbon dioxide in the cabin and in his spacesuit was rising. Cooper kept his wits about him and using his wristwatch to time his manual control of the retrorockets, his knowledge of astronomy to use the stars as reference points, and a grease pencil to draw lines on the window of the capsule to stay aligned with constellations as he flew, he executed an absolutely beautiful textbook landing. Under Cooper’s expert touch, Faith 7 splashed down in the ocean 4 miles from the prime recovery ship, the USS Kearsarge. That landing was, to date and despite the lack of automatic controls, the most precise capsule landing in NASA history. Cooper’s cool-headed flight marked the last of the Mercury missions and the last manned mission until the launch of Gemini 3 in the spring of 1965.